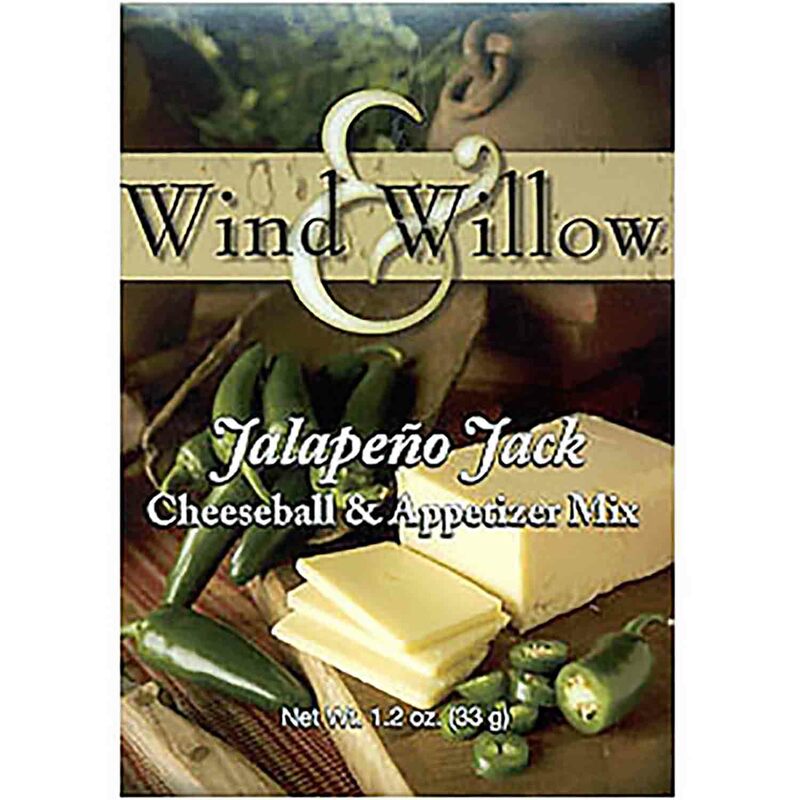 Brand: Wind & Willow WW-33111 Units: 1 mix This is a great savory cheeseball & appetizer mix! Jalapenos, smooth Monterrey Jack cheese and just the right blend of southwest spices. This one scores big for parties and is the perfect base for appetizers with a little extra kick! Just add 8 oz. cream cheese and 4 tablespoons butter. Serve on crackers, breads, bagels, etc. This is a great savory cheeseball & appetizer mix! Jalapenos, smooth Monterrey Jack cheese and just the right blend of southwest spices. This one scores big for parties and is the perfect base for appetizers with a little extra kick! Just add 8 oz. cream cheese and 4 tablespoons butter. Serve on crackers, breads, bagels, etc. Ingredients: Cheeseball: Monterey Jack, Blue Cheese (Cultured Pasteurized Milk, Salt, Enzymes, Disodium Phosphate), Dehydrated Red and Green Bell Peppers, Creamer, Partially Hydrogenated Soybean Oil, Corn Syrup Solids, Sodium Casinate (Milk), Mono and Diglycerides, Dipotassium Phosphate, Soy Lecithin, Salt, Dehydrated Jalapeno Pepper, Maltodextrin, Corn Syrup Solids, Sugar, Spice, Dehydrated Onion, Whey Protein Concentrate, Whey, Annatto Extract, Turmeric Extract, Disodium Inosinate, Disodium Guanylate, Autolyzed Yeast Extract, Hydrolyzed Soy Protein, Chicken Fat, Dehydrated Garlic, Silicon Dioxide, Lactic Acid, Calcium Lactate, Citric Acid. Topping: Dehydrated Green Bell Pepper, Dehydrated Onion, Dehydrated Red Bell Pepper. Contains Milk, Soy.